Career, social media, and personal milestones in this week's recap! More and more, Barbie is being recognized as a capable actress, especially after winning Best Supporting Actress in last year's Cinemalaya for her perfomance in the film Mariquina. The 18-year-old was recently handpicked by director Louie Ignacio to star in his upcoming Badjao advocacy film, Laut. "Flattered po ako talaga noong sabihin sa akin na ako ang napili raw ni Direk Louie. Nakakakaba lang kasi parang ang laki ng expectations niya sa akin," the Kapuso talent told PEP.ph. "Sa lahat naman po ng mga ginagawa ko ay sinusigurado ko na binibigay ko ang lahat ng makakaya ko." You go, girl! To no one's surprise, Maine Mendoza, better known as Eat Bulaga's adorable Yaya Dub, has just hit—and as of press time, has already surpassed—the million-follower mark on Facebook. She wrote on Twitter, "Woah wait I just hit 1M followers on Facebook and 600K on Instagram. AMAZING. Thank y'all!" Though kind of paltry compared to her actual fan count, expect that number to still grow. 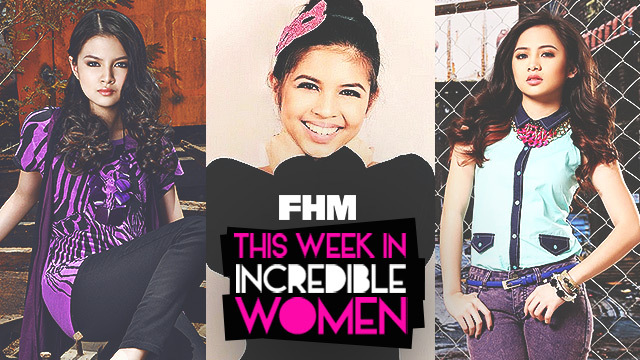 Congrats, Yaya Dub! Indeed, Marian's beauty is pang-international. A few days ago, the Malaysian chapter of the Marian Rivera and Dingdong Dantes fan club, DongYanatics, uploaded on Instagram a photo of Marian—with her glorious pre-pregnancy bod—being featured on Malaysia's local broadsheet, Metro Ahad. Can't wait to see you again on our pages, Yan! Click here for more on Marian! Click here for more on Ella! The singer, who is married to IT executive Gavin Lim, recently introduced the new addition to their family. Juris wrote on Instagram, "Yesterday (8/16/15), we welcomed God's precious miracle. Gav & i fondly call him Giddy while growing inside me for months. Praise God! Thank you Lord for our son. Thank you guys for you prayers!" Cheers!